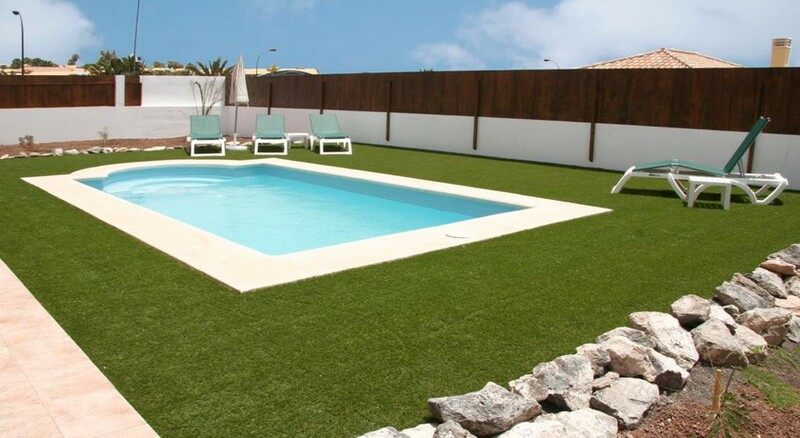 Located on the mesmerising island of Fuerteventura, Ereza Villas Alicia are only a few hundred metres from the beach. These modern and elegant villas feature a private swimming pool, garden, flat-screen TVs as well as free Wi-Fi. They also feature of spacious living areas, quaint bedrooms, a fully functioning kitchen and much more. The private garden includes a sun terrace with a swimming pool with barbecue facilities. The Caleta de Fuste Beach is about 750m from the property, while the Fuerteventura Airport is 8km. Ereza Villas Alicia enjoys a prime location in Caleta de Fuste and is only 750m from the Caleta de Fuste beach. The Fuerteventura Golf Course can be reached in three minutes from the property. There are several casinos, cinemas and shopping centres within a kilometre’s radius from the hotel. The Fuerteventura Airport is about 8km from the property. 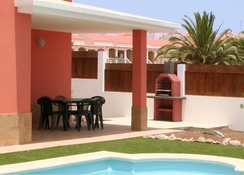 All the villas offered as accommodation here at Ereza Villas Alicia have three bedrooms. These spectacular villas feature a spacious living room, a master bedroom with a double bed, two smaller bedrooms with single beds, a fully functional kitchen equipped with a stove, microwave, coffee machine, fridge and dishwasher. Other amenities in the villas include a 32” flat screen satellite TV, music player, iron with ironing board, safe box, hair dryer, private pool, solarium around the pool, barbecue and sun beds. Towels are changed weekly twice and the villas are cleaned once in seven days. All the villas offer free Wi-Fi. Ereza Villas Alicia offers barbeque facilities and usually guests cook meals of their choice as the villas come with fully equipped kitchens. You can also explore the neighbourhood, which has a plethora of bars and restaurants. Make sure you head to the Volcano Restaurant, Nestor's Restaurant & Steakhouse or Fun in the Sun. Popular Bars in the area include The Dog and Duck Pub, Pieros Cafe and Restaurante, The Zanzibar among others. Head out for a day of golf at the Fuerteventura Golf Course and come back for a lovely refreshing evening dip at the outdoor pool. The hotel has a large area for guests to unwind and solariums to soak in the Canarian sun. The beach is at a walking distance of ten minutes from the hotel. Leave the beach for a few hours and get ready to discover the charm of the island’s interiors. The mountain of Tindaya is considered the most emblematic natural monument of Fuerteventura. It is a place of worship for the first inhabitants of the island, who spoke of it as "the magic mountain." Close by is Tefia, a small town, interesting for lovers of rural tourism. Here you’ll find an ancient aboriginal settlement.